how to set wildfly‘s uriencode? i write a jsp,in this jsp,i use <a> to transe "username" to servlet TestEncoding. 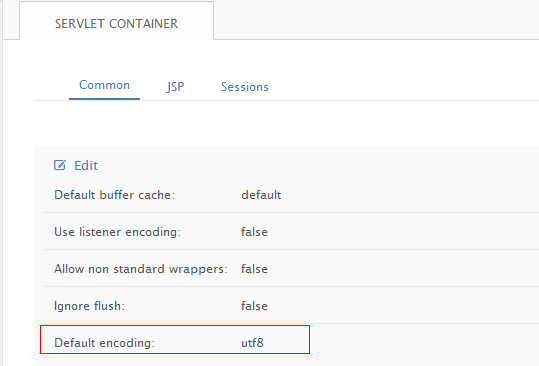 on tomcat,we can add URIEncoding="UTF-8" to "<Connector ....>" to modify uriencode.but i don't know how to modify it on wildfly. but it dosen't work,who can tell me how to modify wildfly's uriencoding? i look forware to your anwser,Thanks! 1. Re: how to set wildfly‘s uriencode? in jboss-web.xml in your applications should do the trick. 2. Re: how to set wildfly‘s uriencode? But it seems to be not works,I'm doubt that it isn't the way to configure the URIEncoding of wildfly. Tomcat and JBoss AS 7configure the URIEncoding on Connector. I also want to know the wildfly default charset,ISO-8850-1 or UTF-8? * that can parse the underlying form data asynchronously. Does it show us that "ISO-8859-1" is wildfly‘s default charset?or URIEncoding?